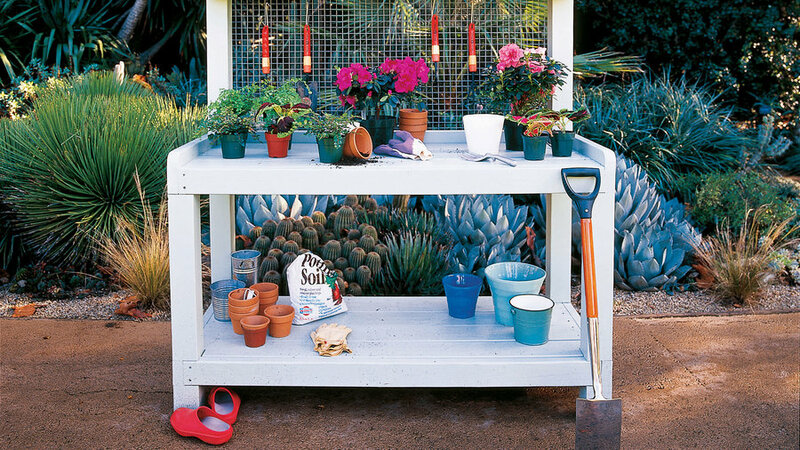 The 63-inch-tall bench is perfect for the behind-the-scenes dirty work of potting young plants. The 5-foot-long bench, which the intermediate woodworker can build in a weekend, is made all the more durable by using 4-by-4s for legs; 2-by lumber is used as horizontal boards that fit snugly in dado joints cut in the legs. Since we planned to paint our bench (and to minimize cost), we used Douglas fir framing lumber, but you could substitute redwood, cedar, or pressure-treated lumber. To finish the project, we used a sage green satin exterior latex paint, and we nailed a galvanized metal screen with 1-inch-square openings to the back side of the bench, between the top shelf and the main workbench frame. Slip large S-hooks into the screening in order to hang garden tools. For a free set of plans for this project, click here to download a printable file, or send a self-addressed, stamped, business-size envelope to Sunset Potting Bench Plans, Sunset Magazine, 80 Willow Rd., Menlo Park, CA 94025.